From lecture at Institution of Civil Engineers (1883). 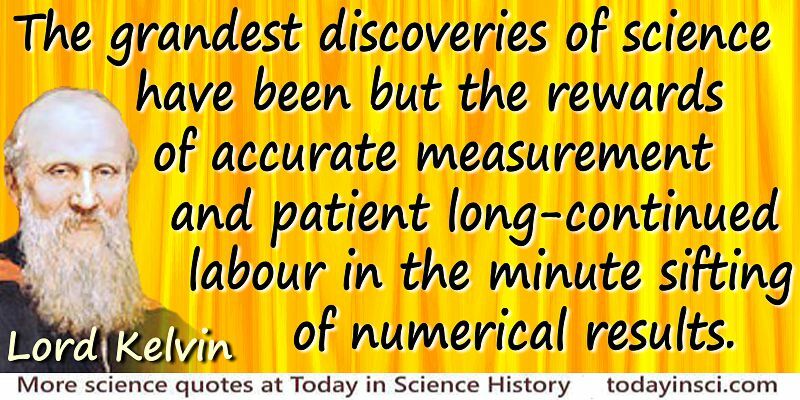 “Faraday’s discovery of specific inductive capacity, which inaugurated the new philosophy, tending to discard action at a distance, was the result of minute and accurate measurement of electric forces. Joule’s discovery of thermo-dynamic law through the regions of electro-chemistry, electro-magnetism, and elasticity of gases was based on a delicacy of thermometry which seemed simply impossible to some of the most distinguished chemists of tho day.